Perma Basins - the basin built to leak! Perma Basins™, patented by Turf Drainage Company of America, not only collect surface water but have permeable sidewalls to collect seepage water around the basin — firming the soil profile up around the basin. Perma Basins are specified by architects on new projects, as well as used by superintendents wherever a drainage basin needs to be added or replaced. Easy installation makes them perfect for in-house replacement for older plastic basins that tend to “trash over” with grass clippings due to narrow openings. No other basin provides the flexibility of a Perma Basin. 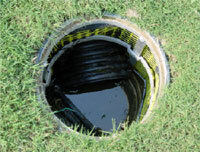 Different models are available depending upon the depth needed to collect seepage water, but all models have universal sleeves that enable the installer to connect 4” to 8” pipe without special fittings. 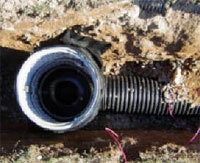 Seepage drainage collection lines and solid pipe outfall pipes can be graded through the same sleeve. Standard units range from 18” to 6 feet deep, and can be custom made to any size. Constructed of cast aluminum, Perma Basins have a clean appearance as well as the largest grate opening in the industry to help reduce the “trashing over” from grass clippings that is common with other basins. Perma Basins have become a popular item with architects for new construction projects, including being specified by the PGA Tour on 10 different TPC courses. Because they are designed from the beginning to have permeable sidewalls, they help to firm the areas up around the drainage basin. They not only are easy for contractors to install, but when the project is completed, they are the easiest basin for a superintendent to add drainage to in the future. 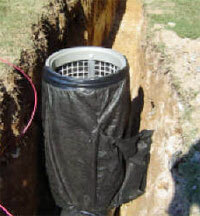 Permeable sidewalls to not only collect surface water but also the water trapped in the soil profile around the basin. 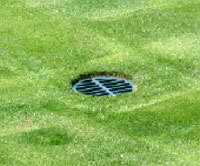 Large openings between the grate bars reduces the tendency to “trash over” from clippings. The deeper you build the basin, the more area there is for storage of trash under the outfall pipe. No need to knock out holes in the basin walls to connect outfall pipes. Simply slide pipe up and down to the grade desired and backfill. No special fittings or connectors needed for different sized pipes. Universal sleeve connector simply wraps around the pipe to be connected. All-aluminum construction means years of service. Won’t deteriorate in sunlight like plastic grates do.